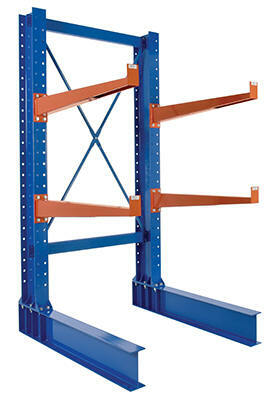 The Cantilever Racks are ideal for eliminating storage problems. 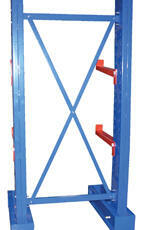 The steel constructed design allows for quick and efficient handling by forklift or by hand. The rack includes pre-drilled holes, adjustable arms for access to variable heights, and front lipped arms to prevent items from falling. Available in both single sided and double sided units with the option of standard, medium, or heavy duty construction. Baked-in powder-coated toughness. *Capacity is per level. 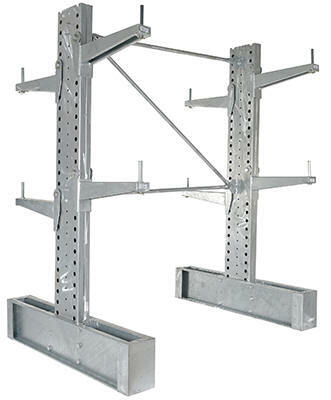 The Galvanized Cantilever Rack systems are ideal for distributing and industrial settings. The galvanized steel design minimizes rust while providing a strong construction. The adjustable rack arms can be adapted to a customized position allowing the unit to fit the needs of individual circumstances. *Capacity is per level. 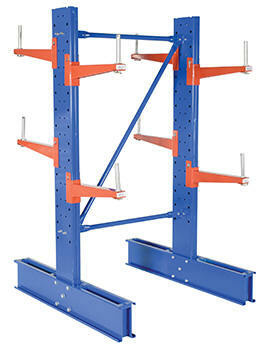 The Standard Duty Cantilever Rack Systems are great for manufacturing and distributing facilities. The steel construction provides strength and durability, which allows the unit to withstand the harshest of environments. The adjustable arms allow the unit to be customized to fit the needs of individual circumstances. Individual components are sold separately to accommodate your requirements. *Capacity listed is per upright. 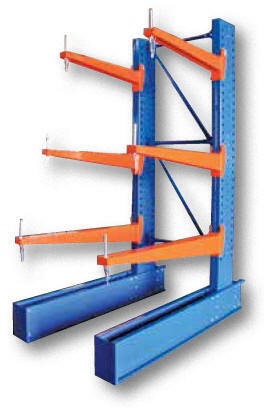 Cantilever Rack Systems offer flexibility to custom-fit individual applications. The unique bolt together construction with welded steel components offer a great combination of strength and durability. Arms and uprights are sold each. Powder coat finish. All assembly hardware is included. Medium-Duty Cantilever Racks are ideal for manual loading; open design affords easy forklift accessibility. Store bar stock, pipe, tubing, lumber and other light hard-to-stock items that must be kept off the floor. Arms are adjustable up and down the full length of the upright. To adjust align arms with pre-drilled holes and secure with key lock. All arms feature lips to prevent product from falling off. Uprights are sold separately, not in pairs. Custom rack systems can be designed for your special application. Length Uniform Capacity Per Arm (lbs) Wt. 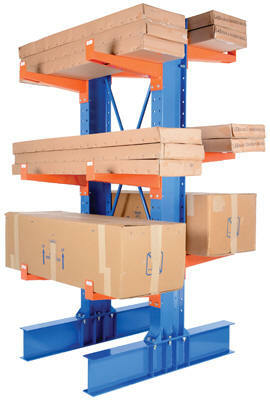 Heavy-Duty Cantilever Racks are completely adjustable for application specific design flexibility. Long, unwelded stock is handled quickly and efficiently by forklift; instant accessibility to one piece or a full load. Arms are adjustable up and down the length of the upright. Pre-drilled holes on the uprights are spaced every 3." for bolt-on arm placement (hardware included). All arms feature lips to prevent product from falling off. Standard arms have a 3⅛" lip. Heavy-duty and extra heavy-duty have a 3." lip. Uprights and arms are sold each, not in pairs. Custom rack systems can be designed for your special application. *Capacity listed is per upright. Download the MDU Owners Manual in PDF format.